They take that philosophy much more precisely than some do. 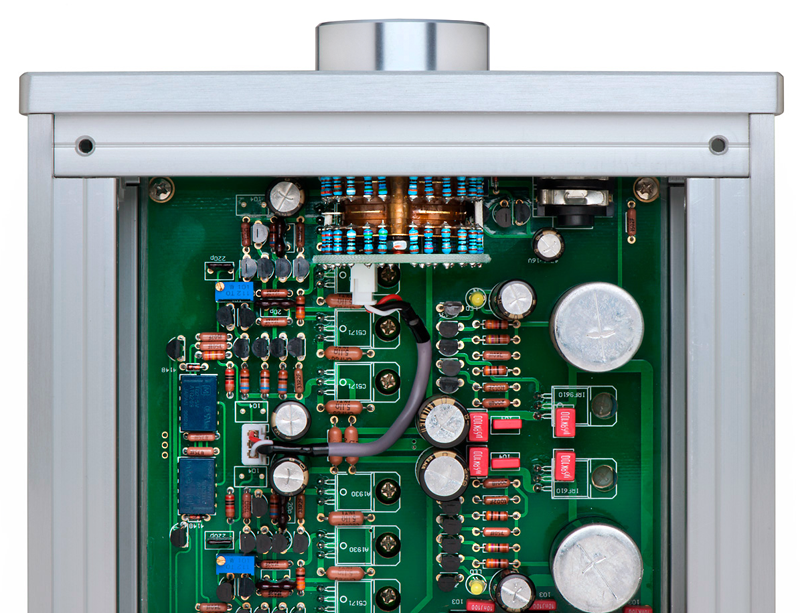 Burson Audio eschews standard circuitry building blocks like opamps, ICs and even standard transformers. Afterall, each of those blocks are made to accomplish a wide range of tasks and are comprised of many piece individual parts. Burson Audio designs highly specialized solid state circuits suited to the specific application. And the circuitry itself is beautiful. Burson Soloist headphone amp power supply. Burson Audio carries their philosophy all the way through to the attractive solid billet aluminum enclosures. The precision-machined fit and finish is phenomenol, easily in the same league as the finest highend audio components. Aesthetically beautiful to the eyes and sonically a treat for the ears. Although known primarily for their Head-fi components, Burson's Conductor incorporates a world-class DAC, Class-A headphone amplier & Preamp into a gorgeous enclosure. Combined with their Timekeeper amplifer (which can be configured to operate as a single Class-AB stereo amplifier or with two Timekeepers in mono operation) one has the basis of a true highend system that will fit into virtually any listening room. Just add a pair of speakers and a source and you're headed for sonic heaven! CNET's Audiophiliac (Steve Guttenberg) put Burson's tiny Timekeeper amplifier through a thorough listening review-session, even pairing the diminutive Timekeeper with the extraordinary Hansen PRINCE E speakers ($42,000/pair). "...the Timekeeper's power and low-end muscle were immediately obvious. There's an almost tubelike sweetness to the sound. Cymbals have a realistic metallic sheen and three-dimensional body. The Timekeeper also nails the subtle stuff, resolution and detailing of reverberation on live recordings like Wilco's "Kicking Television" seem remarkably natural. The stereo image is broad and deep -- you feel like you're present at the recording session. The Timekeeper is tiny, but there's no mistaking it for anything but serious high-end gear." "From the outset, I was impressed with the heft of the unit, especially given its small size (7×10x3 inches). Weighing in at just over eleven pounds, it is obvious that this is a serious piece of gear. The case is made with extruded aluminum panels, the advantage being that the extruded material is much heaver than cast or billet aluminum, with much more finely finished surfaces, not to mention better heat dissipation. Combined with the high-quality RCA connectors on the rear panel, the Soloist has a very high overall build quality." "Given the performance of the Soloist as a headphone amp, I was anxious to give it a turn as a preamp in my main system. I wasn’t disappointed—rather, I was pleasantly surprised. The Burson more than held its own, even against the five-times-more-expensive VAC preamp. At the price point of the Soloist, I expected more than a few sonic shortcomings, especially since this is a transistor unit, but it never exhibited any edge or harshness. Instead, the sound was just ever so slightly on the warm or sweet side, but not objectionably so. I found the tonal balance to be quite pleasant. I attribute that slight warmth or sweetness to its class-A origins." Schedule an audition at WSBNYC to give Burson Audio a listen!